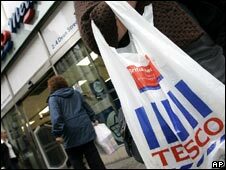 Tesco is expected to announce a 10% rise in annual profits when it releases its latest yearly results on Tuesday. The UK's largest supermarket group is tipped to report pre-tax profits of about £2.8bn, thanks to global sales of some £47.4bn, also up a predicted 10%. Amid growing signs UK consumers are now spending less due to fears over the economy, analysts will be looking for what Tesco says about current trading. Tesco is also likely to defend its continuing plans to break into the US. Tesco's annual results will cover the 12 months until the end of February. For the fourth quarter it is expected to say that UK like-for-like sales - which exclude new store openings - slowed slightly from the 4.1% rise seen in the third quarter. Conversely, it is tipped to announce another big rise in its global sales. Tesco now operates in 13 countries around the world, with more than 1,200 stores from China to Poland, the Czech Republic and Thailand. However it is Tesco's US operations that are likely to most interest retail analysts. At the end of last year Tesco launched its latest American venture, called Fresh & Easy, opening 15 initial stores across a number of western states. Yet last month it was revealed that its expansion plans for the chain had been put temporarily on hold. Press reports say Tesco will reaffirm its commitment to the US market, and that the roll-out of the Fresh & Easy chain will start again in the summer. "Reassurance on current UK performance is as important as last year's results," said Citi analyst James Anstead. "The market will be keen to hear any comments on the current state of the UK, given the [Tesco's] fairly weak Christmas statement." More than £1 in every £7 spent in the UK retail sector passes through Tesco's tills.